We’d love your help. Let us know what’s wrong with this preview of Eko by Loren Walker. Midnight in Osha: an injured woman is left at the gates of a commune. Eighteen-year-old Sydel, an apprentice hungry to prove her worth, is certain that healing the blue-haired stranger will finally win the respect of her community. But tensions spike when two men appear in search of their sister: Phaira, the woman in the clinic. And when Sydel’s experimental medical treatments prove successful, instead of offering accolades, her elders make the sudden decision to banish her. To ask other readers questions about Eko, please sign up. LOVED this story! Solid sci-fi with a unique premise. Very little is standing in the way of this being a five-star review. There were some editing issues; a handful of typos and some continuity quirks that rankled a little bit. Nothing I wasn't willing to overlook for the sake of a good story though. I also felt that there were details missing that I would have loved to have. I assumed it was post-apocalyptic, but then there was a comment that made me think this is another planet? Alternate univer LOVED this story! Solid sci-fi with a unique premise. Very little is standing in the way of this being a five-star review. I also felt that there were details missing that I would have loved to have. I assumed it was post-apocalyptic, but then there was a comment that made me think this is another planet? Alternate universe? Maybe I missed some vital explanation? Or maybe it was never important to the story, since I still thoroughly enjoyed it. I don't do plot rehash, but I'll try to give you a glimpse into the premise. In this reality, some humans have unique abilities. 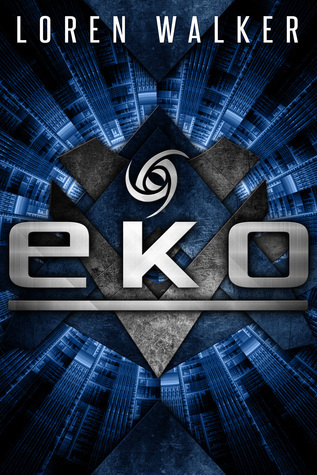 Eko, which is essentially being able to send and receive thoughts, mind-reading and such, seems to be the more common ability, if this story is anything to go on. The second book in the series will be Nadi, which is another of the four identified abilities, and I'm terribly excited to see what this series will bring, and what will be exposed about these abnormalities, as well as the world. Some people see these abilities as abominations, feeling the need to wipe them off the planet. Meanwhile, others seek to harness these powers for their own purposes. Obviously, that brings all kinds of conflict to the table, and leaves the story open to all new kinds of danger and excitement. TONS of potential! Loren Walker builds a beautiful world, with in-depth character building. Her characters made me angry, made me laugh, and made me hurt. I could not wait to get to the next page, the next chapter, and now the next book. If you are looking for a good read, I highly recommend this series. Interesting plot with interesting characters. I wish there was more detail about the world, but this is the first one in a series, so that can come later. A full review should be available on Reader Views soon. First, let me just say that Eko is an extremely fascinating book. It follows the story of a girl named Sydel. She basically has a unique ability, called Eko, that allows her to hear people's thoughts and even send her thoughts to them. Sydel isn't the only person with this special ability. When I first started reading this book I had a little bit of a difficult time getting into it. You're kind of thrown right in with no backstory so it is hard to keep up with what is happening. It was about a th First, let me just say that Eko is an extremely fascinating book. It follows the story of a girl named Sydel. She basically has a unique ability, called Eko, that allows her to hear people's thoughts and even send her thoughts to them. Sydel isn't the only person with this special ability. When I first started reading this book I had a little bit of a difficult time getting into it. You're kind of thrown right in with no backstory so it is hard to keep up with what is happening. It was about a third of the way through the book that everything finally clicked and it all made sense. Don't get me wrong, it was all still very interesting even when I didn't fully understand exactly what was happening haha! But when it clicked...Aha! It went from good to great! I definitely recommend this book to anyone who likes the YA Dystopian/sci-fi genre. It's a good one! Loren Walker is a Pushcart Prize nominee; her poems have appeared in QU Journal, the West Texas Literary Review, Coffin Bell Journal, Sugared Water, and other publications. She has published two chapbooks, Dislocation and strong-water, and is working on her third collection The Skeleton Dreamer, examining facets of death and dreaming. Loren's debut fiction novel, EKO, won the Library Journal Indie Loren Walker is a Pushcart Prize nominee; her poems have appeared in QU Journal, the West Texas Literary Review, Coffin Bell Journal, Sugared Water, and other publications. She has published two chapbooks, Dislocation and strong-water, and is working on her third collection The Skeleton Dreamer, examining facets of death and dreaming. Loren's debut fiction novel, EKO, won the Library Journal Indie E-book Award for Science Fiction, was awarded a BRAG Medallion, shortlisted for the Half the World Global Literari Award, and selected as a Shelf Unbound Notable Indie title. The sequels, NADI, INSYNN, and NYX were released to high acclaim. She is now embarking on a new series: a young adult fantasy-science fiction trilogy, starting with The Witch Machine. Loren is the author and illustrator of the children's book Juniper Key and the Very Serious Girl. She is preparing two new children's stories: The Pigeon and Kid Sparrow, and Hello Shadow.